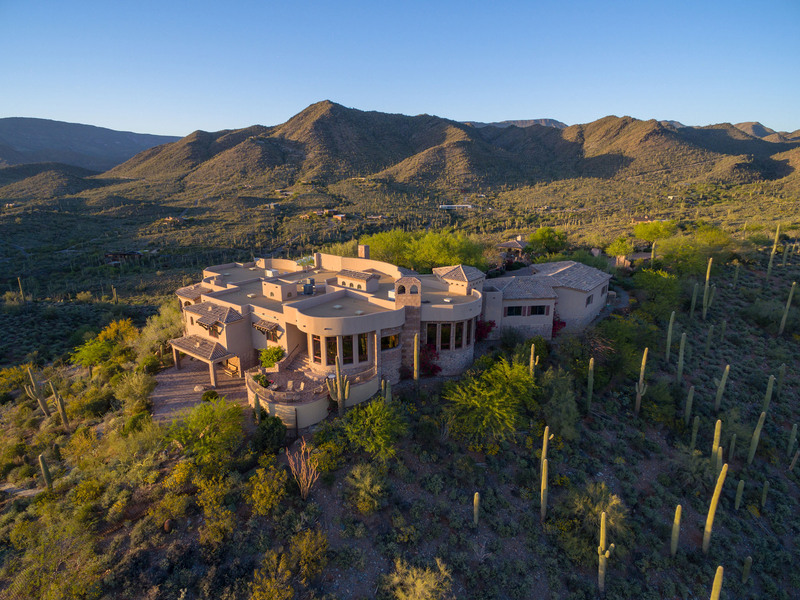 Luxury retreat on 54 acres with 360-degree views from the Upper Sonoran Desert in Cave Creek, AZ will sell to the highest bidder, regardless of price on May 5th, 2016. Supreme Auctions will offer Saguaro Sanctuary in Cave Creek, Arizona, at a luxury no reserve absolute auction in cooperation with Preston Westmoreland of Russ Lyon Sotheby’s International Realty. Like most of Supreme Auctions sales, this sale is predicted to close within 30 days, via their accelerated marketing process; one that is considerably faster than the traditional real estate buying process. “The luxury auction of Saguaro Sanctuary follows on the heels of yet another Supreme Auctions’ record sale in neighboring Carefree, Arizona just last month,” said Jennie Heal, President of Supreme Auctions. 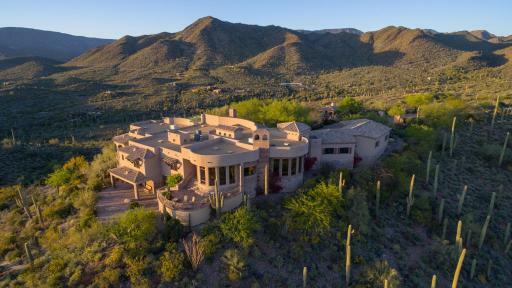 Saguaro Sanctuary is an old-world, Tuscan-Mediterranean style home that rests on its very own mountain. At 54 acres, this estate offers more acreage than any other in the area, acreage that the new owner can have all to themselves. Or, if preferred, the land can easily be separated into 5-acre lots, each with their own access and horse-friendly zoning if desired. Designed and built by Tom Argue, this Cave Creek, Arizona residence has been showcased by the Wall Street Journal, Arizona Republic, and Fox 10’s Cool House segment. Home to CEOs and celebrities in the past, Saguaro Sanctuary offers complete seclusion with a private road that runs through the late silent movie star Grace Frederick’s estate. The starlet herself granted easement for construction of the road when Saguaro Sanctuary was built. The home itself offers six bedrooms, seven bathrooms, and an array of specialty rooms that includes a media room, recreation room, fitness room, two wet bars, and an extensive climate-controlled wine cellar. A chef’s kitchen and both formal and casual dining areas, extended five-car garage, and elegant pool area, with a separate outdoor gourmet kitchen in the tiled ramada, make entertaining friends, family, and colleagues a breeze. Many rooms in the home, along with the private nature path, meditation area, and numerous patios and porches, offer stunning views of the desert, Scottsdale city lights, and sunsets that will take your breath away. “Some of our favorite moments have been watching the sun come up in the morning and set at night, and then see the stars come out as we sit around the fire pit,” said the current owners. “With the air so crisp and clear, we have the most beautiful city lights and night views.” 360-degree views include Spur Cross Ranch Conservation Area; the towns of Carefree and Cave Creek; Scottsdale and Phoenix; not to mention one of the densest concentrations of mature Saguaro cacti in the world – located within the boundaries of the estate. Just a short drive down the quiet road, the Western town of Cave Creek offers gourmet dining, shopping, art fairs, and live music. Deer Valley airport accommodates private jets and is just a 10-minute drive away. Also in neighboring Scottsdale and further to the Greater Phoenix Metropolitan Area are both the Scottsdale Municipal Airport and Sky Harbor International Airport; The Mayo Clinic; world-class entertainment and Signature golf courses; and numerous Fortune 500 company headquarters. Saguaro Sanctuary will be sold in a luxury no reserve absolute auction on May 5th, 2016. Interested parties can call Supreme Auctions directly at (866) 929-2243 or visit www.supreme-auctions.com.